Gas Detector Comparison | Mil-Ram Technology, Inc.
Loop Powered Detectors are typically operated using two wires connected to a regulated 24VDC power supply. The two power wires also carry the measurement signal. The Gas Detector on-board digital-to-analog converter (DAC) normally regulates the flow of electrical current in the range of 4-20mA, where 4mA represents zero meter indication and 20mA represents full-scale gas concentration. The 4mA reading provides a 'live' zero for fail-safe operation. Typically, specific current values below 4mA are designated for acknowledging various fault conditions. A measurement instrument (PLC, DCS, etc.) 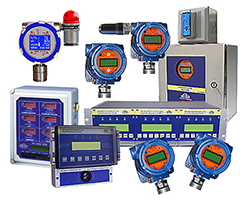 is installed in series with the current loop to provide monitoring, alarming and data acquisition functions. Since the two wires that provide power also carry the critical measurement signal (4-20mA), the gas detector power requirement must be sufficiently low so as not to disturb the 4-20mA signal. 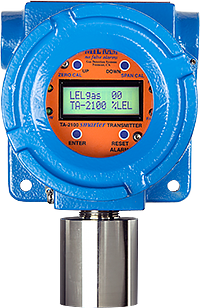 This low power requirement necessarily limits the type of sensor that can be incorporated in the gas detector. Electrochemical type sensors are normally low power devices and therefore, highly suitable for loop powered applications. Most other sensor technologies (catalytic, infrared, PID, Solid-State MOS, etc.) require considerably more power than a loop powered configuration can support. Electrochemical sensors are widely used for measuring various toxic gases at low ppm levels and also, oxygen measurement at % volume levels. Four wire Detectors utilize one pair of wires for connection of power (regulated 24VDC) and a separate pair of wires for carrying the 4-20mA measurement signal. The Gas Detector on-board digital-to-analog converter (DAC) normally regulates the flow of electrical current (signal) in the range of 4-20mA, where 4mA represents zero meter indication and 20mA represents full-scale gas concentration. The 4mA reading provides a 'live' zero for fail-safe operation. Typically, specific current values below 4mA are designated for acknowledging various fault conditions. A measurement instrument (PLC, DCS, etc.) is installed in series with the current loop to provide monitoring, alarming and data acquisition functions. Since the two wires that provide power are separate from the two signal wires, the gas detector may draw significantly more power than the loop powered design without affecting the 4-20mA measurement signal. This means several types of sensor technologies can be utilized including electrochemical, catalytic, infrared, PID, Solid-State MOS and more. The four wire type detector provides the broadest range of detection capability related to the range of sensor technologies that can be applied. Combustible gases are typically measured using catalytic or infrared type sensors, necessitating a four wire type detector. Additionally, since more power is available to operate the Gas Detector, an integral Relay Module and/or Modbus Interface can be provided.